How to limit a website's viewport height with html, especially for desktop users? How to validate radio button selection with PHP? How to make <hr> tag responsive? Is there a way to limit a website's viewport height with html, especially on desktop/alternatively is there a way to create a viewport on a page that displays the page of another website url within the viewport? I want my webpage to have a limited height, regardless of the user's screen size. Try to use container on everything after body tag and specify it width/height using media queries. I am coding a bot to interact with a page there is this checkbox that I need to check and the .click function won't work so I found it would be easier to change the class from "icheckbox_minimal" to "icheckbox_minimal checked" But I have no idea how I can change that class with my VBS file Or is there another way to check the box? <input class="checkbox" type="checkbox" value="1" name="order[terms]"
I have one page with two forms. Depending on the radio button selected (one is selected by default) one of the forms is showing and the other one is hidden (using JS and CSS). When the user fills in the form field and submits the form both forms are validated and the page refreshes. I am looking to achieve that on submitting the form only the corresponding form is validated and the page is not refreshed. How can only one form be validated and the page prevented from refreshing (i.e. keep showing the manual form after submission)? Looking for a solution the following suggestions did not solve the problem: Proper way to handle multiple forms on one page in Django, How to submit form without refreshing page using Django, Ajax, jQuery?, http://jquery.malsup.com/form/. Bootstrap navbar not showing in mobile version but using desktop mobile emulator it shows perfectly. I save web pages as html. The web pages have button having google map hyperlink directly to photos of places. Thus the link is huge. When i open html in chrome, the huge hyperlink does not load and shrinks to maps.google.com/1z,2b,3c - that's it ! I check console/inspect of html, entire huge hyper link is saved. So the problem is while uploading not saving. What to do, what an error! I have two radio button selections (within a form tag) that I would like to have verified server-side with PHP. The validation should be: if the user has not made a selection, it will return an error message. Else, if valid it will return a check-mark. My code (below) is not working for some reason and I can't figure out why. It doesn't return the error message when user failed to make a selection. Any suggestions? I have a question how to make the tables jQuery-DataTables responsive? when I give the hr tag 400px it works well in the full screen but when the screen size is reduced to mobile size that is below 500px it doesn't look nice so i tried with 90% width then it works fine for extra small screen but when then screen is small or above it takes up more space horizontally which i don't want. I actually wanted that when i resize my window the horizontal line should appear the same as it was appearing for full window or even for small break-point. I'm practicing bootstrap4 layout, when screen width is less than 992px, my brown-div is override by yellow-div, why and how to fix this? 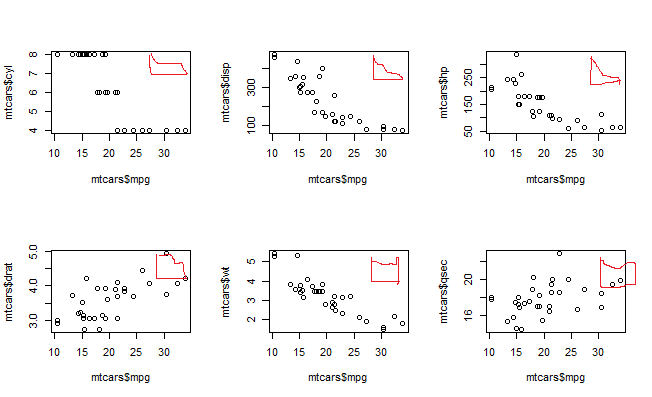 I want to produce an array of plots using base R, each with their own insert plot based on ggplot, aligned to the right, slightly lower than top right so that I can add some text above. 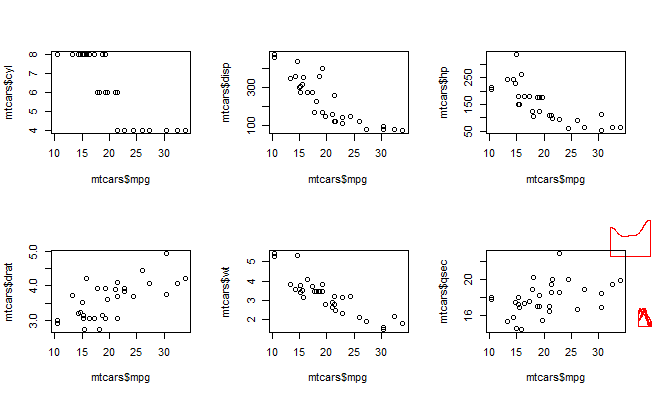 Something like this (I have hand drawn the ggplot inserts using MS Paint). I think this might be possible using viewports - similar to this question. I am attempting to create a multi-user, multi-screen application within JavaFX, and I am having trouble with the multi-screen part. Think an FPS with couch co-op: the screen splits evenly depending on how many people are connected locally. Every different view is looking in a different direction, and at a different place, but at the same 'world'. I learned the hard way (confirmed in a comment here) that each node can only appear in the active scene graph once, so, for instance, I cannot have the same node spread across multiple distinct panes (which is conceptually ideal). And that's where I'm not sure where to go next. Looking at other similar technologies like OpenGL, (example) most have the ability to create another viewport for the application, but JavaFX does not seem to have this. How would I go about creating multiple views of the same set of nodes, while still maintaining individual user control, and changing persistence/moving nodes, between every different view? I am rendering an AcroForm in my web app. The rendered canvas size is same in desktop browsers. Even if I resize the window to small, the rendered canvas size remains same.Which exactly what I want. But when I render the same pdf in mobile or tablet the canvas size increases. I want it to be same as the Desktop browser. Please note, I do not want the fixed canvas size for all the pdfs. For respective pdf, I want the mobile's canvas size same as desktop's canvas size. // Fetch the PDF document from the URL using promises. // Use a promise to fetch and render the next page. // Create the page view. // Associate the actual page with the view and draw it.